news and notes from jess and dan: splash! 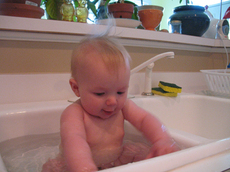 Xander and I used to bathe together in the big tub, which was a nice mommy-baby bonding time and reminiscent of his birth...but alas, he stopped enjoying the group bath and seemed afraid of the water. UNTIL, that is, I taught him about splashing. This, of course, makes bathing more fun for him but a little dicey for bystanders and bathing partners who would prefer to keep their eyes dry. Just in the nick of time, he has gained the ability to sit unsupported, hooray! For a limited time only, he has both the perfect skills and the perfect size for a really fun (if somewhat swampy) kitchen sink bath. Video below, of course. Still photos couldn't possibly do the experience justice.